It’s hard to capture lightning – or, in Tommy Stinson’s case, the party – in a bottle. The Replacements were that party. Boy, were they. But truly great parties like this are magical things. They just happen, and there’s only so much you can do to force it. And poor Stinson has been chasing it for a long time. Tommy Stinson was bassist in the post-alternative rock heroes the Replacements from the band’s 1979 start to its 1991 breakup. For Bash & Pop, Stinson moved over to guitar and lead vocals, and though he put together a band and released 1993’s Friday Night is Killing Me, the band broke up the following year. Stinson eventually went on to — of all things — Guns N’ Roses. At the same time, he took part in a Replacements reunion…. As the bad mojo of another Monday slowly exits your corporeal abode maybe a little live music on Tuesday night can help expedite the eviction process. While Atlanta has a multitude of live venues, each with their own peculiarities, the EARL has always been one of the best. 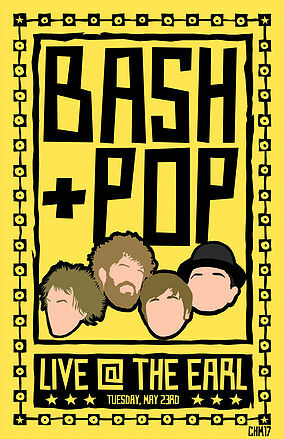 This Tuesday night they once again demonstrate their booking acumen by bringing the phenomenal Bash + Pop to the stage.